The number of people who play ultra-violent video game Call of Duty each day. If there's one thing history has taught us, it's that there's nothing like a bit of good old-fashioned violence to get the juices flowing. And that's about to be proven yet again by new game Call of Duty: Modern Warfare 3, which is set to become the world's most popular game, after it was released this morning. Its predecessor, Call of Duty: Black Ops (an uber-violent Boy's Own adventure set during the Cold War. And involving Nazi experimentation, natch), sold 5.7m copies globally in its first 24 hours, and more than 20m in total, raking in more than £600m in its first six weeks. Its explicit violence also caused outrage among, well, pretty much anyone who works with kids - despite the fact that there's an in-game option to 'turn down' the profanity and bloodshed. Charming. 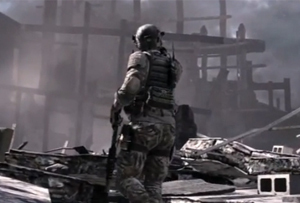 Modern Warfare 3, though, is expected to top those sales figures, with games retailer Game saying it had received 15% more pre-orders than the previous installment. Coupled with the fact that that some fans have been queueing for it since Friday, that record looks pretty likely to be broken.